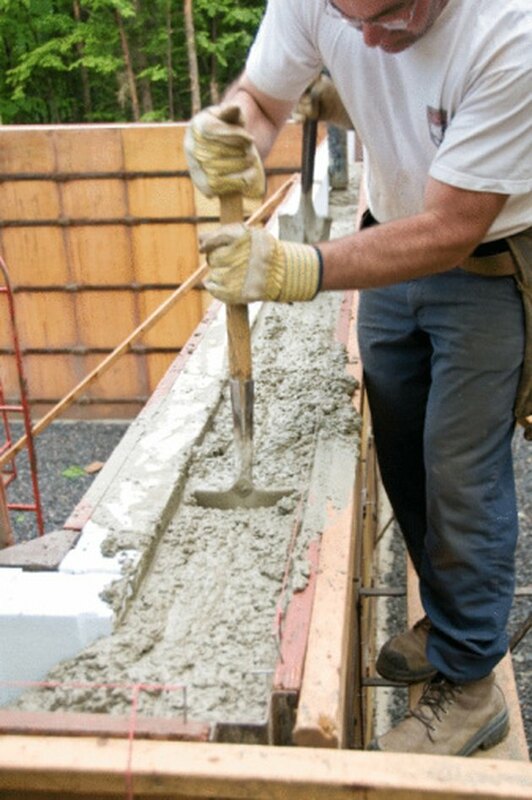 Concrete gains strength as it hydrates, which is a process that can take years. The initial mixture of water and dry concrete begins the process but leaves the concrete malleable initially. Holding the concrete steady while the minerals and chemicals in the concrete form a bond requires the use of a concrete form, which can be removed after a few days have passed and the basic shape is stable. Building a basic concrete form requires the use of plywood and 2-by-4s. Cement forms can be made from any available, sturdy material. Measure the area that will need the concrete form. Mark the plywood with the height and length measurements including any odd curves, bends or steps. Cut the plywood to the proper size using a circular saw. Attach a 2-by-4 to the outside of the plywood shape so that the 2-by-4 stands vertically. The first board needs to be attached so that the 4-inch side of the 2-by-4 is flush with the outside of the plywood while extending 2 inches beyond the vertical end of the plywood piece. The overlap is used to secure a second plywood form to the first as necessary. Screw the 2-by-4 into place with 2-inch wood screws spaced evenly from top to bottom. Screw the remaining 2-by-4s into place, spaced every 12 to 24 inches along the outside edge of the plywood. The boards must stand vertically and have the 2-inch edge pressed against the plywood. The last 2-by-4 along the face of the plywood should be flush with the edge of the plywood sheet. Repeat Steps 1 through 4 for each side of the form to give you the four walls necessary for the form. Connect the different walls by driving screws through the first 2-by-4 board that overlaps the end of the first wall to the last 2-by-4 that is flush with the end of the other wall.